The cars being at least equal is my opinion and that off the majority, I'm highlighting Vettel's version as being different and in that respect I'm wondering whenever he's winning a race he views himself as being in the fastest car or it's simply down to him? Vettel only started to play catch up after he crashed in Germany and spun at Monza, there was nothing wrong with the car, he should have won both races. Arrivabene may well have not lead Ferrari very well but he can't be blamed for Vettel's various mishaps neither can the development mishap that caused Ferrari to lose performance for 3 races but still overall left Ferrari with the better car more often than not and a more reliable car to boot, yet Vettel didn't come close to winning the title, so sorry if I have little patience whenever I see attempted excuses being made for Vettel. Germany perhaps, but he was already well into catch-up territory by the time Monza came around. And I don't think you can possibly claim with any certainty that he should have won Monza, since we don't know if he would have been faster than Hamilton, who was faster than Kimi. The Mercs were better on their tyres there than the Ferraris were. Anyway, we digress. The point is that if Vettel feels he was playing catch up, then he may well have felt he had to overdrive the car, which makes Siao7's point valid. As to you point about how he may view himself, I think that could be applied to more than one driver tbh. If he felt like he was playing catch up at Monza then that's only because he crashed in Germany, if he had won the race then it would have been Hamilton playing catch up, that was on Vettel not Ferrari. Not only because of his crash, surely? Have you forgotten Hamilton was allowed to keep his win, despite breaking the rules? He decided on his own to skip the final corner when he realised they were losing the race, when coming into the pits. Why the stewards thought that only warranted a reprimand is puzzling to say the least. Yeah, I found that pretty puzzling, too, but at least it's consistent - they didn't say anything when he drove across the grass in Mexico 2016, either. Nobody's claiming that all the blame is on Ferrari. Just let's gloss over some of Vettel's glaring mistakes which were the main reason he was having to play catch up as you called it. There seems to be a narrative of saying Vettel made mistakes because he was having to play catch up. If Vettel had not crashed none of that would have played out. ...or when Rosberg cut the chicane in Canada 2014. This has been discussed to death already. For that particular infraction the most common outcome is a reprimand. There have been a handful of penalties for it but warnings/reprimands are far more common. ...but not for what Hamilton did? I'm talking about for what Hamilton did actually. Probably quoted the wrong post. Yep you quoted the reference to Rosberg. Kimi got a 5s penalty and 2 penalty points on his licence in 2016 at the European GP. The reason given was "the driver crossed the white line separating the pit entry with all four wheels and did not enter the pit lane." I'm just wondering how that was different? Historically more reprimands than time penalties are given out for those incidents. And it would have surely only have been a 5 second penalty which could have been negated if Bottas had held everyone up anyway. Was this not brought up before were tracks have different rulings and drivers are warned of penalties beforehand? are you suggesting drivers aren't aware that it's not allowed to cross white lines and go over the grass? Seriously? They need to be reminded each race? I believe they have different rules for different tracks, some penalties are applied and some aren't, and the drivers are informed of that? 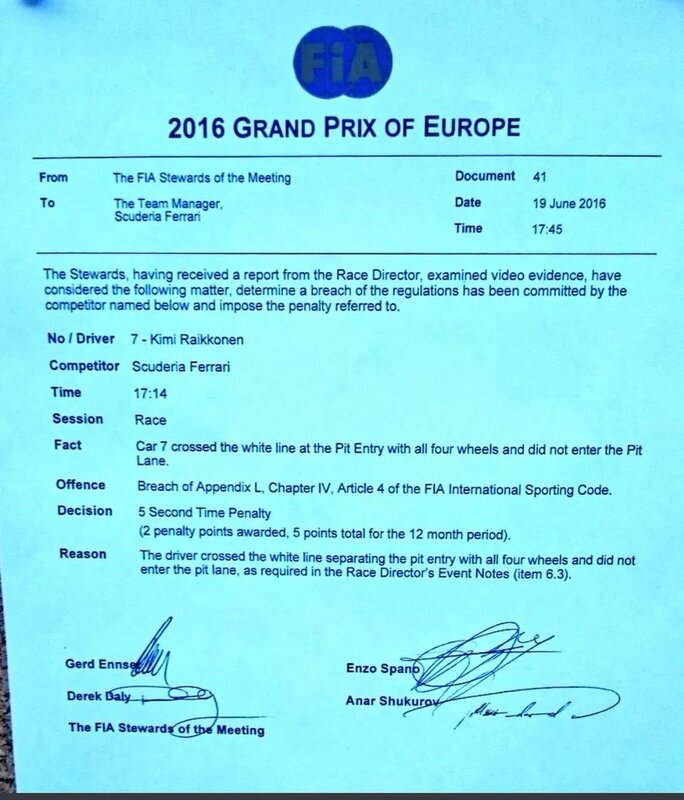 I wonder when Kimi's penalty was found others that were not penalised were conveniently ignored? Different rules I'm not sure. They do make a point to remind drivers about some things, mainly one that comes to mind is not to exceed the track limits over a corner, which happens at some GP's because of their layout. Again, in Lewis' case the pit lane entrance was separated by a strip of grass between it and the track. Are you seriously suggesting that drivers would expect to be informed that going off-roading is not acceptable? Drivers do get reprimanded but you are suggesting that Hamilton should have got a 5 second penalty despite the fact there is no such precedent for that being the automatic punishment and in this case Hamilton also got a reprimand. You yourself seem to be trying to create a precedent for Hamilton to receive a 5 second penalty because Kimi received that punishment when there is no such thing. This was discussed at the time in some detail were at some tracks penalties are automatically given because they are deemed to be more dangerous and drivers are informed of this. How ironic how people continue to get the wrong end of the stick, my precedent stance still stands firm there is no contradiction. Thanks for that link, Pokerman. It is a good illustration of my point; crossing the line of the pit entry did indeed not often carry a penalty other than a reprimand. But the compilation doesn't show whether any other drivers were guilty of not completing a lap. I remember Räikkönen at Baku, and vaguely Massa at Brazil, but most of the incidents on the list don't ring a bell. Reading the rule in question, it is difficult to say whether the difference between simply crossing the lines "accidentally" and consciously deciding to cut across the infield back onto the race track because the driver spots a competitor staying out, is significant in the eyes of stewards. But the two cases aren't identical, so why should the penalty be? Actually coming back to Kimi's penalty I remember the reason for it now, the drivers were told specifically that once they enter the pit lane entrance then they would be penalised if they ventured back onto the track, the entrance is part of the long straight and it was deemed too dangerous to be using the entrance as part of a defensive maneuver. How am I trying to create a precedent? Can I go back in time to make sure the punishment is given? And how is it a precedent if Kimi got penalized before Hamilton did? You appear to have ignored the points I made in your reply. The majority of the incidents given in that link - and I looked a fair few of them up to be sure - were completely different to the Hamilton situation. Basically, he effectively left the track - as the pit lane entrance diverged from the race track - then changed his mind and went cross country to rejoin, simultaneously cutting the corner and bypassing a section of the track while he did so. I know you're keen to defend Hamilton no matter what but come on, you'd have to say he was exceedingly lucky not to get a penalty for that one. This is hilarious, in the post above you dismiss setting a precedent, while last week you were all about it. This reeks of double standards, as it is about Hamilton. Ah, I see. Ok, this makes more sense, you mean that they have some extra rules for some tracks due to their nature, not different rules (as in a different rulebook). Agreed, I did not remember this one to be frank. This thread isn't about Hamilton or Kimi leaving the track - it is about Arrivabene leaving. Please get back to the subject or take it elsewhere. According to the top of the page the last time I logged on here was Dec 19th. I see that nothing much has changed. It's like your first trip back to your neighborhood bar after being away for awhile. The same core bunch of punters making the same arguments on the same topics as when you left. On one hand you can't believe that nothing changed, while on the other hand you just have to marvel at the fact. The only thing I'm surprised by is that I haven't seen any unrelated threads turn into Senna v Prost debates. But then I haven't gotten through all of the threads on the first page yet either. Edit: Also the endless "Server Hang Up" errors are still around I see. I don't think we've had a Senna vs. Prost argument in a while, actually. But we've made up for it by turning a few threads into Hamilton vs. Vettel or Alonso vs. Hamilton & Vettel when they had nothing to do with any of those drivers. To be fair, absolutely nothing has happened in F1 since then that might give us something new to discuss.